As parents, my wife and I have gone through the “ahh how cute” to “she’s crawling and picking things off the floor” to the “oh no Hon, she’s walking” to the “hide all the chairs, she’s climbing and jumping off the table” stages five times at this point. Through all of these stages we’ve managed to keep our sanity by installing one heavenly item: the baby gate. Of all the baby gear we have ever purchased (diaper bags, car seats, strollers, etc. ), I think the baby gate has been one of the most beneficial to all of us. When properly installed, this marvel of technology keeps your infant out of all non kid-friendly places she shouldn’t have access to and gives you the ability to sit once again (or at least until she reaches the jumping off things stage). As you can imagine, we’ve gone through some really bad, I mean terrible, baby gates. Fortunately for you, you can learn from our mistakes. Below, I’m only going to mention the ones that worked best for us. Safety. You want a gate that will keep your child safe. According to the CDC, the number one cause of injuries to children is falls. By keeping a stair gate in front of stairs, you can keep your baby or toddler from falling. Durability. There is a wide range of durability among child safety gates. You can be sure those on this list are made of high quality materials and will last. Sturdiness. If your baby can push over a gate, it will provide little benefit. Look for a gate that fits snuggly and attaches well. Easy of use. A gate that is hard to open or close will cause you more headache than it is worth, especially if you have older kids who might leave the gate open. 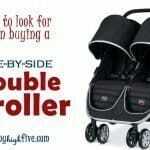 There are plenty of good options that are hard for a baby or toddler to open but are easy for older kids and adults. 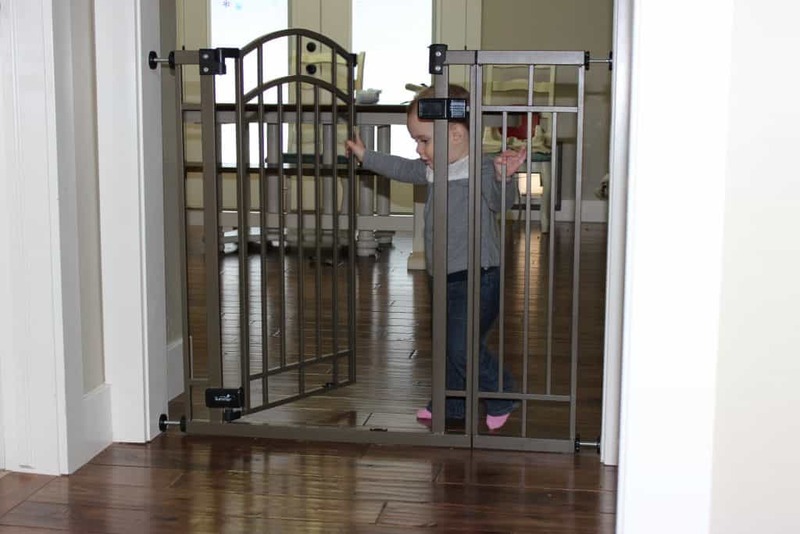 If you’re looking for a pressure mounted baby gate, look no further than the Summer Infant Extra Tall Walk-Thru Gate. 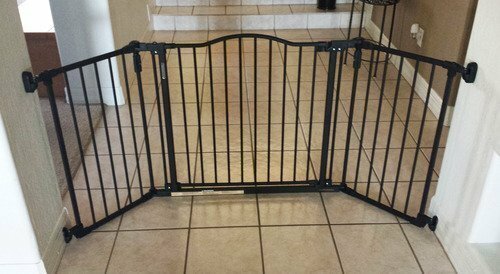 We currently have multiples of this gate in our house for a few reasons. First of all, it’s easy to install. Simply expand the gate out or in by turning the mounting cups on the side. This should allow you to fit doorways from 28″ to 48″ wide. The next part we love about it is that you can open it and lock it easily. 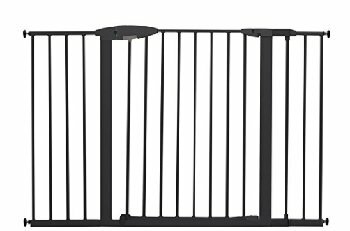 With our first toddler we tried to purchase one of those cheap plastic pressure mounted gates. After having tripped over it dozens of times I can tell you that the extra money I saved with that gate was lost on medical expenses! We eventually graduated to taller versions of that model, but even those had their issues with our infants knocking them over. Finally, I decided to bite the bullet and get the gate my wife had recommended all along, the Summer Infant Tall Gate. It was like I’d died and gone to heaven. You’d think I would have learned with the umbrella stroller fiasco. No longer do we trip over the gate. No longer can our babies push it over. The gate is sturdy, locks well, and gives you back your sanity. If you plan on putting it on the top of the stairs, I’d recommend you occasionally tighten it as it will loosen over time. Other than that, it’s maintenance free. This black metal baby gate looks great in any space. It does just what you need it to do–keeps your baby in a safe place. The Munchkin Easy Close is sturdy and strong without damaging your walls. I like the versatility of this gate. It fits doorways 30-52 inches; if you need it to go even wider you can purchase an additional extension. Even my acrobat toddler can’t find her way over the 36 inches of height on this gate. There is a double-locking system on the Munchkin Easy Close, making it easy for you to open, but very difficult, if not impossible, for your toddler. An optional third lock at the bottom of the gate makes it swing just one way. If you don’t like the way the bronze model above looks, I also really like the Regalo Easy Step. Like the Summer Infant Gate, it’s pressure mounted for easy installation. The gate itself will fit doorways from 29-39 inches wide and even has additional extensions that allow you to use it in doorways up to 60 inches wide. To open the gate you use a lever style handle with a safety lock that your child won’t be able to open. One thing nice about this gate is that it’s a bit more intuitive for guests at your house. Still, if I have one gripe about it it’s that you have to manually lock it rather than pulling it closed. Overall, it’s an easy-to-install and durable gate that helps to keep kids and animals where they belong. For those worried about the cups damaging the wall, a wall saver accessory can be purchased to avoid any damage. If you need a baby gate for a wider opening or entrance, I’d recommend you go away from the pressure mounted design and use included hardware to screw it into the wall. One company I’d recommend for these type of gates is North States. They have a bronze or linen-colored Deluxe model gate which works for openings between 38.3″ and 72″ wide. The gate is nice because it opens and closes from both sides and even allows you to detach it from the hardware for storage. Being able to remove it is a really nice option for events or parties. If you need to go beyond 6 feet, you can also order 6-bar expansions which each add up to 15 inches. As many as six of these extensions can be used to make this gate expand up to 13 feet wide. Overall, this is a good and sturdy baby gate for stairs, but if you’re trying to install it into your drywall, it doesn’t come with drywall anchors. Be sure to grab some before picking it up. It’s also difficult to install if you have two different widths because of something like a baseboard. In that case, you may need to install a spacer on the upper wall that makes them even. Ok, so I feel a little bit bad about this next one (but not really). This baby gate can be used as anything from an extremely wide option to an option that literally fences your child in or your Christmas tree out. Every once in a while you run into a situation where creating your own baby gate circle play area within the middle of the room is the best and safest option for your baby. 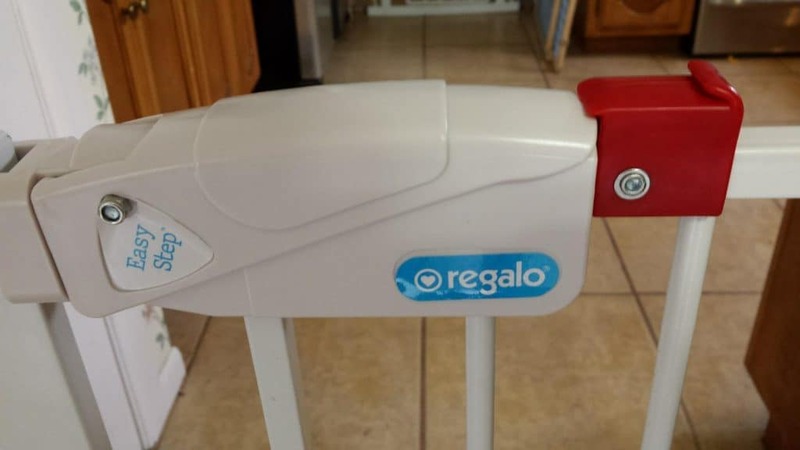 For these types of options, I highly recommend this Regalo Super Wide Gate and Play yard. 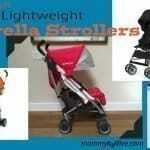 There are several other options out there that have designs your baby can literally climb up. In our case, that happens very early in life and makes that type of gate useless. For this configurable baby gate, they’ll need much longer before they’re able to get over. By that time, you’ll probably be able to communicate with them. This is also a great option for a pet gate. For anything 48″ and under, I highly recommend a pressure mounted design. They’re easier to use and don’t leave holes in your wall. For everything else, you’ll have to go with a screwed-in hardware design. 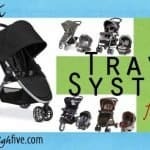 What baby gate tricks do you use to keep your babies and toddlers in your restricted areas? Be sure to let me know by leaving a comment below.